Just updated Hub and my notification settings are all gone. I have over 10 different accounts in HUB and now they all buzz. Try a reboot? See if they come back after. Seems off they would just disappear but there has been issues reported with the latest upate. After the reboot, BBM is still vibrating. Whatsapp is fine. Hang on people. This is not a bug. I am writing up an explanation to this; should be up tonight. Sarek1701 and Crusader03 like this. With that said, after I rebooted, my notification for Whatsapp was restored. So there still may be a bug that needs to be resolved. I reset my BBM ringtone and all is well now. I'm not able to resolve my BBM notification tone issue... it won't stay on after resetting it to the BBM tone notification. Same. I'll have to try uninstalling it which ducks because I'll lose my conversations. What a joke. Yes, you do lose your conversations but unfortunately this is the only fix to the tone notification issue. I uninstalled the Beta version and went back to the production version and all is good now. I have never heard back from Gusti after it was requested to send logs a couple of days ago. Unfortunately there doesn't appear to be any support from BBM Customer Care or Technical Support. Weird. I'm on the latest official release from the Play Store. I'm not in the beta program. What version are you on? When I uninstalled the Beta version and after doing a 32+ second reboot I downloaded the non Beta version in Google PlayStore. Is there no tone or you change it to something and it goes away to default one? There is no tone... when you set a tone, in my case the BBM Tone, it would stop working. When you checked the tone notification settings it would now show a random series of numbers and no tone. Since uninstalling the Beta BBM app and installing the production BBM app all is good and I have the BBM tone notification working. Weird. I didn't have to uninstall. Clearing the app cache worked. What a weird bug. Interesting... I tried clearing the app cache but that didn't work for me unfortunately. In the end all is good for me running the production BBM app. I only have a couple of friends that on different continents that are still using BBM. Everyone else around the globe have switched to WhatsApp. Haha me too. Just my girlfriend and I. It's sad because it has so much to offer but it's not "cool" with the kids so it doesn't get the attention it deserves. I also noticed it to be set to a non-existing file when I didn't get notified. But after setting it to the usual BBM one, it worked fine. Strangely I am not in the Beta team for BBM. Guess mine just got corrupted. I probably wouldn't be using BBM today if it wasn't for the fact that a couple of lady friends still use it. I started using BBM when it was released in 2005 and it was the go to messaging app. BlackBerry was very popular with people like myself that traveled internationally and BBM was the texting format we all used. My lady friends who live outside of the US still use it... they love the stickers... hahaha So I hang onto using BBM until maybe one day I can get them to switch to WhatsApp. Ok I just updated my BBM and now I am getting no tones issue as well. It's setting to random number. The only solution is to not use BBM / BBM Priority ring tones. If you use any other, they stay just fine. Last edited by TheBond; 12-14-18 at 08:27 PM. Oh no... what version did you update to? I'm on the production BBM App version 3.3.19.69. Since uninstalling the BBM Beta App I haven't had the no tone notification issue. I didn't try any other tone notifications... that's very interesting. I'm so conditioned to the BBM tone notification having used it for so many years I don't know if I would like a different tone notification for BBM. Yeah that would be it. The storage could cause it. I have a feeling that they moved the ring tones or renamed it and something in the storage is breaking it. Last edited by TheBond; 12-14-18 at 08:57 PM. Actually a better way is to re-add ringtones from the Ringtones folder via Application / Notification settings. 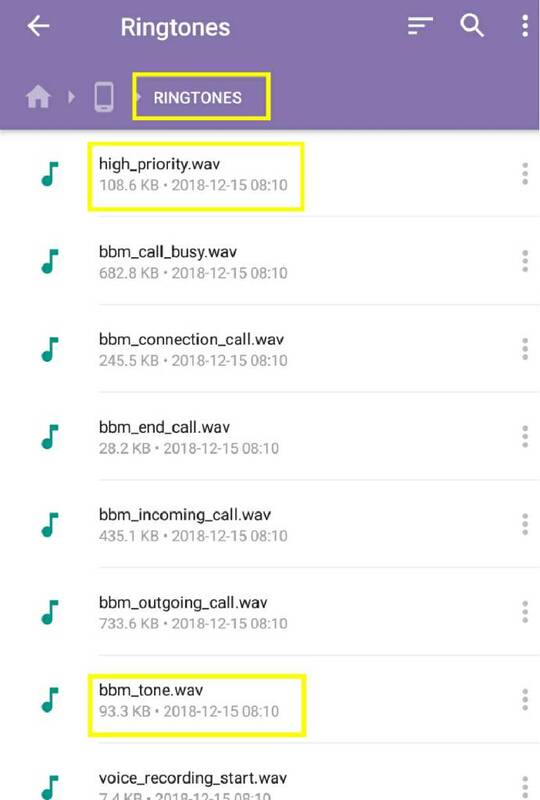 BBM doesn't let you add Custom Ringtone directly from the app. You will find BBM and BBM High Priority ringtones in there. Last edited by TheBond; 12-14-18 at 09:42 PM.